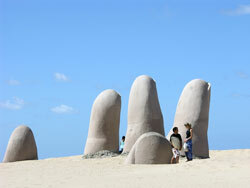 Uruguay’s exciting capital is a city of beautiful architecture, stunning beaches and a rich cultural heritage. 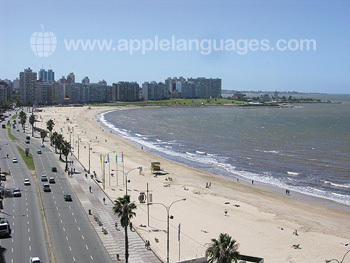 You’ll always have something to do if you take a Spanish Course in Montevideo! Relax on the perfect sandy beaches, or enjoy any number of water sports, from sailing to kitesurfing. Enjoy a coffee whilst you watch resplendent white yachts slip in and out of the marina, before taking a stroll to discover the colonial riches of the old town. The Teatro Solis and the Casa Rivera, which offers a fascinating insight into Uruguay’s past, are particularly worthy of a visit! A spacious, modern building, in a prosperous area, is home to our school in Montevideo. Close by are gorgeous beaches, as well as attractive parks. The school itself is well-equipped with 17 classrooms, a video/DVD room, library and computer room with Internet access. Our Montevideo school offers a range of Spanish courses, differing in intensity and focus. The Standard, Intensive and Super-intensive courses consist of 15, 20 and 25 hours of Spanish lessons each week. Choose the course which best suits you, whether you want to spend more time studying Spanish or exploring Montevideo. You can learn Spanish in Montevideo on a one-to-one basis, if you would like the undivided attention of our school’s highly-qualified native Uruguayan teachers. Choose from 20, 25 or 30 hours of Private Lessons per week. These private sessions can be tailored to meet your requirements, allowing you to concentrate just on general Spanish, or on technical, legal or financial Spanish. Need to study Spanish for work? Our school runs a Business Spanish course in Montevideo, which will give you the vocabulary you need! If you work in education, there is also a course designed specifically for teachers. 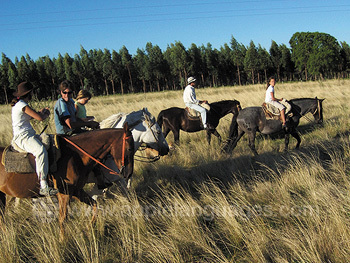 However, you may be more interested in experiencing Uruguayan culture. In this case, our school’s Spanish & Tango course or the Spanish and Cookery program might be the right option for you! 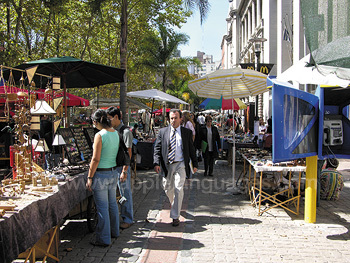 Really experience the local way of life - stay with a host family whilst you learn Spanish in Montevideo! Your friendly host family, carefully chosen by our school, will provide you with two or three meals each day, depending on your preference. They will also provide you with constant opportunities to use your Spanish! All homes are located in the same neighbourhood as our school, making it easy to get to lessons or the beach! If you prefer, you can share accommodation with your international classmates, living in an apartment or a hotel. Apartments are equipped with air-conditioning, kitchenettes, TVs, telephone and safety deposit boxes. Hotel rooms offer a little more luxury and some hotels have facilities such as gyms, jacuzzis and restaurants. Alternatively, you can opt for private accommodation in either an apartment or hotel. Our school can also arrange for you to stay in an inexpensive youth hostel. To introduce you to Uruguay and its culture, our school organises various activities and excursions to run alongside your Spanish course in Montevideo. Typical activities include a tour of Montevideo, welcome party, guided walks, Tango and Salsa lessons, theatre and concert nights, wine tasting, and football matches! Full-day trips are also available, with various destinations scheduled for Sundays. These include trips to the historical streets of Colonia del Sacramento and the exclusive beach resort of Punta del Este! Transfers from Montevideo Airport are available upon request, at a reasonable price. Average score for our school in Montevideo based on 4 previous client reviews. The school in Montevideo was an amazing experience! I had three teachers and they were each extraordinary, kind, and compassionate! My classes were one on one and they were tailored to my needs as a high school Spanish teacher. I honestly wish I could have stayed longer just to have my teachers, the staff were also amazing and kind. My accommodations were good. The host family was nice. The location was superb. I would recommend this family to anyone. I would recommend the school to anybody wanting to learn a language! It was the most wonderful experience I had. The school staff, were so warming,caring and really competente on their job. I take spanish classes in Brazil and my teacher said that the 15 days I got a 6month advance on my spanish language.